Mwenda immediately jumped in his car and headed across town to where we were staying. As for us, within minutes of hanging up, my friend and driver, Michael, arrived to help us re-locate as previously scheduled. The place we were staying, much longer than originally planned, was expecting other guests and needed the flat we were occupying. 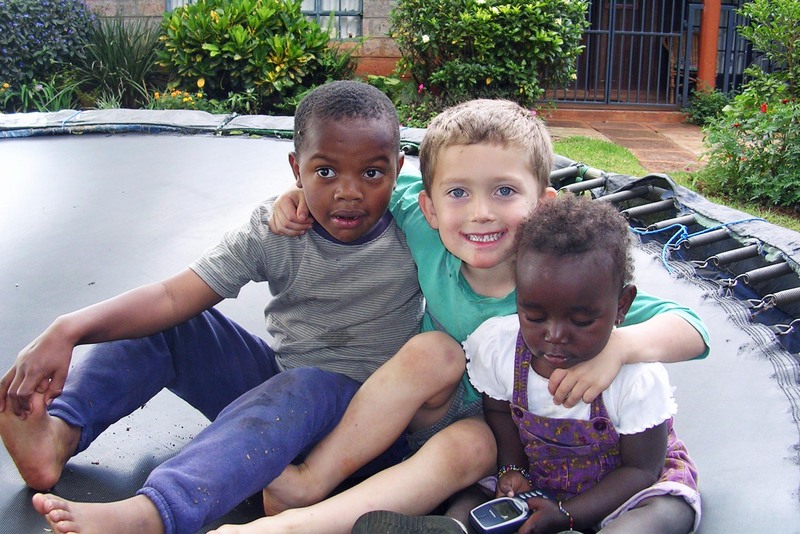 A new friend, an Australian also in process to adopt a Kenyan child, had negotiated for us to move to the home of a missionary at Rosslynn Academy while they left on a one-month furlough. Uncontrollable tears were still streaking down my face as we loaded up the sparse, rag-tag pile of earthly possessions that comprised our sojourner “home.” Three confused little kids who simply wanted a stable mother and a present father, climbed into the van next to me. When I told Mwenda I was giving up, I meant it in the desperation of that moment. Of course, one look at my daughter in the next moment would have changed my mind. But what I didn’t realize was that God was also at work, pronouncing, “Enough!” He saw the last spark in my soul about to go out and shielded its tiny flicker. He had already made arrangements to carry me. Rosslynn Academy felt like His arms beneath me. The international school is located in a large, well-protected compound with lush flowers and trees. Best of all for an introvert emerging from five months in shared-living conditions, it was mostly empty for a school holiday. We were given an entire house to ourselves with a beautiful vine-covered patio. We could eat when we wanted, sleep in quiet, and I felt the pressure lift of feeling like everyone was watching and evaluating if I knew how to take care of a Kenyan child. The children even enjoyed a playground, a trampoline, and a sweet dog that came with the house. The beauty of our new residence flowed under and over us, a healing balm. I felt badly later when I learned Mwenda had gone in search of us; I didn’t think to tell him we were moving. The Karaus called me throughout the day we moved, but I didn’t answer. I was too depressed to talk to anyone, even these dear friends. That night, they tracked us down, perhaps through Michael; I still don’t know. Their sudden appearance at our door and into the living room of our new “home” ushered in God’s tangible tenderness. Soon after, friends from the my church in the US arrived in Kenya for a mission trip. Seeing people I knew and loved brought new strength. I asked the boys if there was anything they wanted the team to bring from home. Jedd’s biggest request was his Spiderman costume. I still chuckle when I think of that little guy walking around Nairobi in his costume, and all the stares and double-takes! There was still another moment of cruel torment for God to carry me through, though. My oldest son, Jacob, age eight-year, whom I missed desperately, finished school in Colorado. He was depressed and struggling. We convinced him to travel with his grandmother, my mother-in-law Joann, in early July to come and stay with me and his siblings for the duration of the adoption. I had not held my precious son since he and David came to Kenya for the Kakamega court date in late March/early April. As my mother-in-law and Jacob checked in at the airport, though, the agent would not allow him to board. His passport expired within five months of his expected return to the US. We didn’t know the rule that passports must expire six months or more after return to the US in order for a traveler to be issued a Kenyan visa. There are no word to express how crushed I felt to receive the news that my son would not be stepping off that airplane. Somehow, by the grace of God, I just kept going, falling asleep and waking up to another day in Kenya. Meanwhile, Mwenda was working hard on our behalf. The re-scheduled hearing took place without incident. The adoption hearing was scheduled for July 29. David and Jacob booked their travel to attend. Of course, the most terrifying part of the case still loomed – finding Lily’s birth mother and securing her signature. We possessed two-year-old contact information for her on the first relinquishment form. In a country with forty-two ethnic tribes, it just so happened that Lily belongs to the same tribe as the Karaus, and of their nephew. Mwenda knew how to track down Lily’s birth mother. He personally picked up the government social worker and drove her to the meeting about four hours from Nairobi. Lily’s birth mother signed the form. And so at long last, six months after Lily came into my care, our family of six threaded through chaotic Nairobi streets with David’s mom, Mwenda, Kenyan friends Pastor Karau and Michael, Sr Cletty and another sister. Once we arrived in the somber halls of the stately courthouse, crowded with waiting, whispering people, every noise echoed from cement floors and walls. Keeping the kids quiet and entertained kept every adult challenged. Finally, after two-and-a-half hours, the judge called us into her chambers. Anxious and hoping to make a good impression, I held Lily as she fussed, weary of all this waiting. I was terrified the judge would conclude Lily was crying because we were not attached, and deny the adoption. I remember little of the proceedings except for a question the judge asked of the boys, “Do you want to have a little sister?” Jacob glanced over at Lily with a confused expression and piped up boldly, “We already have one.” Laughter rippled through the room, at last dispelling the terrible tension. Still, despite our hopes and prayers for a verdict that day, the judge delayed her decision for another week, a date after David’s scheduled return to the US. Adoption hearing day with Pastor Karau, Mwenda, and Sr Cletty.